Editor’s Note: No time to double proofread this, so please forgive any errors. For a number of years a Thanksgiving dinner was provided in our neighborhood, but that isn’t happening this year. However, there are several options outside the neighborhood to participate in a community meal, and two churches will eaven deliver a meal to you if you make a reservation by their deadline. The following information is printed in the most recent issue of Isthmus. Good Shepherd Lutheran Church, 701 Raymond Road., 11 a.m.-1:00 p.m. on Thanksgiving Day. (271-6633, if you have questions). This is across from the Meadowood Shopping Center. This is the closest location to our neighborhood. St. Mark’s Lutheran Church, 605 Spruce St., South Madison, noon on Thanksgiving Day. Homebound? They will deliver a Thanksgiving meal to you if you RSVP by noon on Monday, November 25, 251-8405. First Congregational United Church of Christ, at Breeze Terrace/University Avenue, 12 noon to 3 p.m. Delivery is available if you call in by 4 p.m., Monday, November 25, 233-9751. Area residents, middle and high school students, transit riders & writers: Metro Transit and Madison's Poets Laureate <http://www.cityofmadison.com/MAC/poet.cfm> invite you to send short poems, haiku, prose poems, or excerpts from longer poems, 3-5 lines total to the Bus Lines 2013-14 open call for poetry. The theme is "Write Your Madison." Help us see what you see and hear what you hear. Share your poetry stories about Madison with the thousands of daily passengers who share the bus with you every day for a year, as we cross the Isthmus making connections. This year we're accepting video poems too, to be featured on Metro's website and YouTube channel. Video poems do not have a line or time limitation, so be creative! Select poems will be chosen to appear on a variety of Metro materials, including bus flyers, transfer cards, Metro's website, and even on the exterior of the bus! Participants may even have a chance to read their poems at the June 29th Olbrich Gardens Poetry Invitational. Submission deadline is November 30, 2013. All submissions, including video poems, can be sent to mymetrobus@cityofmadison.com, or mailed to Metro Transit, Attn: Bus Lines, 1245 E. Washington Ave. Suite 201, Madison, WI 53703. Students should include name; school, grade, and sponsoring adult if under 18; and best contact for both student AND adult: cell phone/ email, along with 1-3 poems. Adults entrants should include their name and full contact information with their poems. Authors of selected poems grant Metro Transit permission to display poems in Metro promotional materials. Reminder: We're interested in reading your version of Madison, and helping a large audience of readers of every age to read it too! Please be "family-friendly" - We're open to a wide range of emotion and experience, but poems with inappropriate language and/or adult content will not be chosen. We’re looking for “local.” Include specific place names, details, local language. What are the images and experiences Madisonians would recognize! What are the images and experiences you wish we would recognize? Help us hear that. Free write for fifteen minutes around the theme. After you have filled the time, and the page, read over what you have written. Highlight the three ideas or images that see most interesting and write your poem(s) using those. Find an old poem or story that you never quite felt was finished. Grab a pair of scissors and cut it into sentences, or even parts of sentences. Start moving those pieces around and see if any new combination works. Even if it doesn’t, it may get your imagination going. Find a long poem, pick out its strongest line, and make a new, short poem. Contrasting images and ideas smashed together often make a poem jump off the page. A few vivid detaisl will go a long way in a short poem. So will a good, telling line of dialogue. word choice is really important in a short poem, as are strong, well-chosen verbs, and good titles, if you use one. Remember that these are public poems. You may want to write about yourself, but you may want to try writing from the point of view of someone else: someone you know, someone you’ve read about, a fictional character, or your neighbor’s shoes, for example. Or you could write about someone historical, contemporary, or mad-up in the third person. In any case you should think about how your poem will speak to others. 'Tis the season to support the local economy, in a setting you love. Come to the Visitor Center on Sunday, December 1 from 10 a.m.- 4 p.m. for this annual celebration and sale of local and sustainable arts, crafts and edibles. The Arboretum will feature over 40 sustainable artists and vendors in a festive atmosphere. Come out to enjoy music and meet all of your holiday shopping needs. Free parking. Suggested $1 donation at the door. Buy Local this holiday season! Well, those health care websites haven’t worked out like they should have, but that doesn’t mean uninsured people should give up. If you are uninsured, this is a must read for you. Information is from a flyer advertising a session at the Boys & Girls Club. 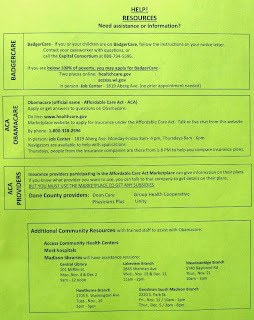 Also see the attachments which detail other places to go for help in filling out an application for Obamacare and other options including BadgerCare if you are below 100% of the poverty level. 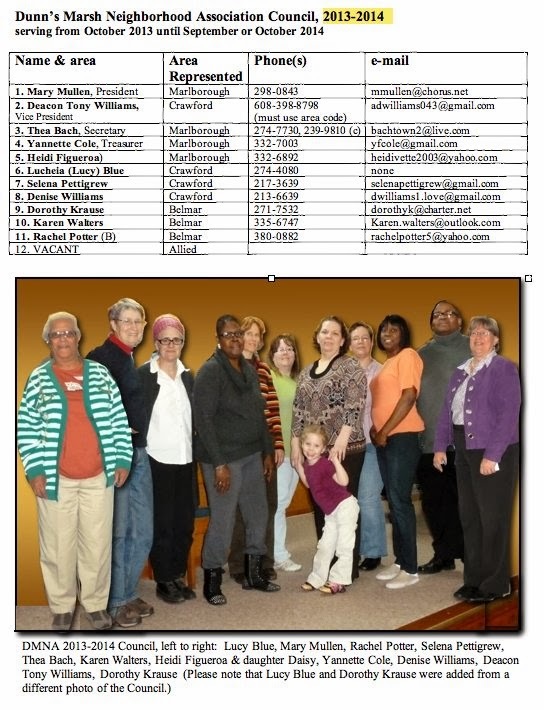 If these attachements are too blurry to read, call one of the people listed below for information on the yellow flyer and 2-1-1 for the United Way flyer. Are you 18-64 years old? YES! Do you have health insurance? Badgercare? NO! 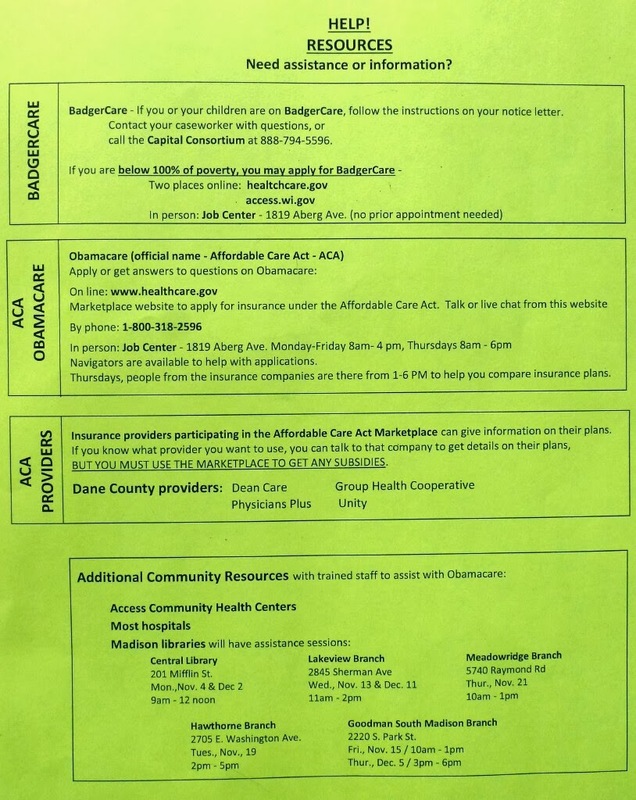 You need to sign up for Obamacare! Get quality health care you can afford. Choose a plan that is right for you and your family. You can’t be denied coverage, regardless of your health. Financial assistance is available. 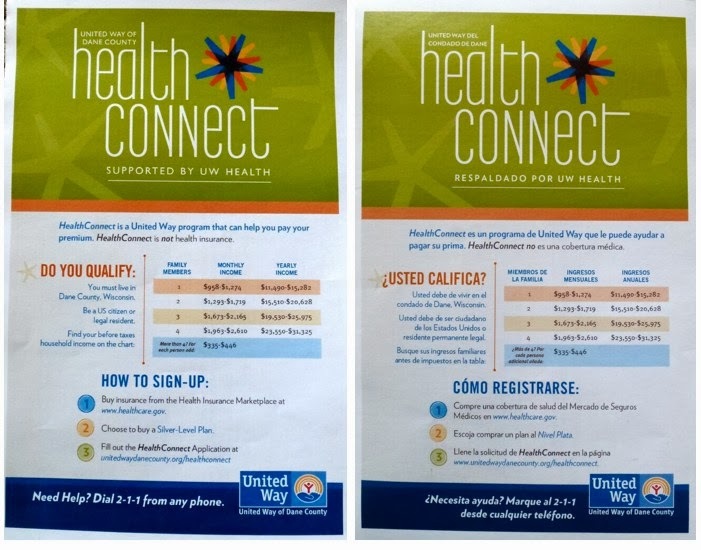 A Health Fair is scheduled for Thursday, December 7, from 10 a.m. until 3 p.m. at the Boys & Girls Club, 4619 Jenewin Road. Assistance will be provided to help you with your application under the Affordable Care Act (Obamacare). Please bring your Social Security number and income information such as employer infor, pay stubs, W2, latest tax return. I hear Medicare had some “glitches” when it started up. But they managed to sign up millions of people using index cards, heaven forfend! Index cards! “Think outside the box,” people keep saying. How about “think outside the web”???? The Wisconsin Department of Transportation (WisDOT) will hold a public information meeting (PIM) to discuss the Verona Road project in Dane County. It will be held on Wednesday, December 11, 5:30 - 8 p.m., at the Fitchburg Public Library, 5530 Lacey Road, Fitchburg. A formal 20 minute presentation will begin at 6:30 p.m. The PIM will focus on the Stage 2 portion of the project that extends between Raymond Road and County PD (McKee Road), and County PD between aproximately Hard Rock Road and Commerce Park Drive. At the second meeting of the new DMNA Council , on Thursday, December 12, the Design Coalition Institute will give a short presentation on Accessory Dwelling Units (ADUs). ADUs are informally known as Granny Flats, Garage Apartments, Mother-in-Law Units, Multi-Generational Homes, and Back Yard Cottages. The City of Madiosn recently updated its zoing codes to allow for ADUs. The ADU presentation will be at 8 p.m., lasting about 20 minutes. The DMNA Council business meeting will precede this presentation. The Council business meeting starts at 7 p.m. Residents are welcome to attend either or both parts of the Council meeting. Residents who want the Council to discuss a particular topic should comment the president in advance of the December 12 meeting: Mary Mullen, 298-0843, or mmullen@chorus.net. After a year when the Dunn’s Marsh Neighborhood Council dwindled to 5 members because of a death, 2 move-outs, and a drop-away, the Council is now almost to full capacity with 11 members. At the October 10 Annunal Meeting, DMNA members choose 7 Council members, and at the November 14 Council meeting 4 additional residents rose to the challenge of joining them. Council member Thea Bach has vowed to find a final member who must come from the Allied area of the neighborhood. Here are the 11 Council members who have volunteered to serve as the governing board of the DMNA until the next Annual Meeting which will be in September or October 2014. The Council is a much more diverse group this year. Two members are native Spanish speakers, bilingual in English. Four are African American. There’s also a range of ages and experience on the Council. Three have served several years on the Council while 8 are totally new. Still, most members have lived in the neighborhood for a while: the range is from a few months, 5 years, a decade and more, and up to 45 years. There’s also diversity in living arrangements. Four members live in apartments, one in a duplex, and six in single-family homes. If you know anyone from the Allied area who would like to serve on the Council, please ask that person to call either Thea Bach or Mary Mullen. These were the words of Valerie Williams, one of the volunteers who helped install the mosaic blocks under the information kiosk outside of Revival Ridge at the corner of Jenewein Road and Allied Drive. She had been looking at the tiles, seeing at first only a jumble of color, nothing more. As Valerie noted, the tiles were only symbolic of what else was happening. We were a multi-racial group, and she was expressing a longing for community with people who now judge Allied Drive mainly by the negative publicity it gets. As a white woman, by default, I represented the many, many whites who might not have much contact with people on Allied Drive. Her words were a plea: Look beyond our color. Come over to Allied Drive and get to know us as people, people who love, people who may be in pain, people who are as diverse in personality as you, people who have hopes, people who achieve. Friday, November 15, developed slowly. I had arrived around 10:20 a.m.to find a note from Christina Kantor, the head of the project. Could I find a wheelbarrow and rakes? I went back home to get them. Christina was a former UW intern who had worked with the ADMNA (Allied Dunn’s Marsh Neighborhood Association) to get the grant that funded the kiosk and mosaic project. She soon returned with the load of 35 foot-square tiles and some bags of sand. They had been created by several community groups under her tutelage. They are similar to the mosaic tiles around the Marlborough Park community garden sandbox and water spigots. As we unloaded the tiles from Christina’s van, Sina Davis, of Mothers in the Neighborhood, helped and then went searching for more people to volunteer on the project. She came up with the Coleman family which was the girls Shaundra, Carmen, Asia, and Felicia, available because school was out due to a teacher’s convention; Valerie Williams and Perry Coleman; and Timothy Collins and his fiancé Janie Thompkins. Selena Davis, ADMNA president and now also a DMNA Council member dropped by. The Coleman girls raked leaves and then swept the sidewalk. Valerie Williams swept and Perry Coleman raked. Timothy Collins and I found place to dump wheelbarrow loads of dirt that had been left in piles by the contractor, and he continued to haul more loads. Janie Thompkins was a jack of all trades, sweeping, loading the wheelbarrows of dirt, and later, with the Coleman girls, tamping the pea gravel and sand and then sweeping the grout into the spaces between the tiles to ready it for a water bath. In the middle of this, Rachel Potter, new DMNA Council member, came to help out too. We were a dozen altogether. It was the perfect day for this work - sunny and crisp with a pleasant breeze. After a few hours, as the job neared completion, I left. I felt totally refreshed not only because of the outdoor work in good weather, but because I had been rejuvenated by participating in a little of the love, pain, diversity, hope, and achievement of the people on Allied Drive. This list of Dunn’s Marsh Neighborhood Association accomplishments over the past year was prepared for the October 10 Annual Meeting. The DMNA hasn’t been lazy by any means. 3. Sponsored many special presentations/events in & for the neighborhood. · 4/3/13 - on art projects related to Verona Rd. Make Music Madison and the annual picnic were most poputlar with over 60 attending each event. 4. Revised, printed and assembled 10 more binders with information about the neighborhood to distribute to new residents. 5. Neighborhood Sign - Submitted final report to the City of Madison and received grant money of $3,310.06, November 2012. 6. Published 12 issues of the Dunn’s Marsh Neighborhood e-News, 4 shorter e-mail notices, and 3 hardcopy flyers delivered door-to-door. 7. Dunn’s Marsh Neighborhood Association website went live in February 2013 www.dunnsmarsh.org <http://www.dunnsmarsh.org> after months of work starting in October 2012. 8. DMNA Neighborhood Council met 10 times. 9. Council members kept abreast of developments, participated in meetings or events, and called or wrote to city staff about neighborhood issues. The guy in the cockpit of the big shovel on the top of the huge pile of asphalt chunks stopped his yellow machine that had been moving the asphalt and came loping awkwardly down the pile. He didn’t look happy. He calmed down and then in a slightly changed voice warned me not to enter the construction site. 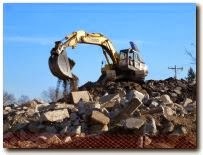 The site is the former commercial area along the Beltline frontage road, now torn down and serving as a storage area for concrete and asphalt that is being recycled for use in the Verona Road project. “I’m just staying here on the curb” I said. Would I want to go and mingle with huge front end loaders, caterpiller-tracked shovels, 50-foot long conveyors, trucks with tires taller than I am, one concrete-crushing machine, and another asphalt grinding machine? Especially when all were in operation? No, I just like documenting the process, and I stay in the public right of way. This is the second time my photo-taking has been questioned by construction workers. Two years ago the workers putting up the high voltage poles for ATC objected to my pictures of the work in progress. What I’m wondering is, what do these guys have to fear? I assume they are doing the job right and my only motive is to show my neighborhood work in progress. I take my photos anyway. Chris Lowry was a graduate student when he joined the DMNA Council in 2006. As a student of the interaction between ground (underground) water and surface water, his major interest in the neighborhood was Dunn’s Marsh. He and his wife Sarah were also involved in getting the rain garden in Marlborough Park. It was planted in June 2007. Is there a moral to this story? Well, consider other DMNA Council members who have gone on to more public roles. David Wallner became a City of Madison Alder. 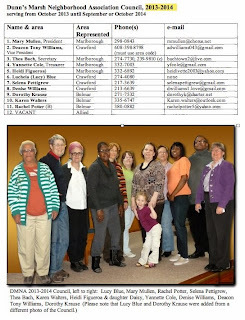 Ron Johnson, Carol Poole, amd Dorothy Krause all became Fitchburg Alders. John (Deke) Welter served on the governor’s …. David Martin served for decades on Fitchburg’s environmental committees. Former DMNA President Solare O’Brien-Brethorst gave birth to a darling baby girl, Phoebe Eileen Brethorst! She arrived at 10:40 a.m., October 16, weighing 7 lbs. 5oz. and measuring 20 3/4 inches long. Solare was president of the DMNA during the 2008-2009 year. She and her husband Tanner Brethorst now live in the country between Madison and Wisconsin Dells. Tanner started and runs the Port Huron Brewing Company, Wisconsin Dells. If you are Solare’s Facebook friend, you can see a number of pictures of the new baby there. The late October Saturday morning is crisp. Starting out, you wonder if it will be too chilly for a t-shirt and a nylon jacket, but as the morning warms, so do the gardeners. What is important are work gloves to protect hands from coarse, rough vegetation. It is the last work day of the garden season, and is time to clean up. This morning, forty people arrive over the next hour at the Marlborough Park Community Gardens (MPCG) to begin the fall clean up that will last into the early afternoon. Community Action Coalition (CAC) Garden Specialist Micah Kloppenburg and community member and leader Angelica Muñoz direct the activities. Angelica has a clip board in her hands to track who shows up. Gardeners have a two-day volunteer component to their community garden obligation, in addition to keeping their garden areas productive and clear of weeds during the summer and fall growing season. The tilled area is being cleared of corn stalks, tomatillo vines, and wooden stakes used to support tomatoes. Tomatillos are typically grown by the Latino gardeners. A number of non-Latino gardeners are growing tomatillos now to make the green sauce and salsa often served in the Mexican restaurants they frequent. When the work is done today, the tractor that plows in the spring will have no obstacles when the soil is tilled for the coming growing season. Workers drag vines, stems, and stalks by hand or in wheel barrows to the mounting pile of plant debris and other organic material to compost over winter. Some chicken wire and more sturdy wire fencing, and many stakes for supporting tomatoes or netting for peas or green beans are pulled out and carried to the side of the plots. Eventually everything is carried to the common area for organizing and storage, or discard. Rolled fencing is stacked into low pyramids while stakes are sorted into lengths of small, medium, and long. The Hmong often use strong branches with netted string for their long green beans to wine around as they mature. These branches are stacked, as well, for next year’s use if they are not too brittle. Perhaps, the most challenging work involves the hoses that snake through the pathways to permit gardeners to more easily water their plants. The hoses hook up to the 6 water hydrants along the edge to splitters where at least 5 hoses can begin. The hydrants are located between the 2 large plots, one 420 feet by 140 feet and the other 320 feet by 80 feet. Often there are many connections between the hose lengths to unscrew to drain the remaining water that can add weight and freeze in the winter. The hundreds of feet of hoses are awkward to pull by hand into coils, which is how they are stored in the central shared shed until the spring. Not so long ago, in 2004, there were just 3 hydrants from which gardeners filled their 5 gallon buckets to carry the nearly 40 pounds of water to their gardens, or else gardeners left the watering to the rain. And in the very early history of the garden there was not even one hydrant. Community Action Coalition (CAC) is an important organization in Madison, WI. Begun in 1966, CAC supports multiple community services including food pantries, homeless and housing assistance, clothing centers and Koats for Kids, and the community gardens. Sometimes services cross over, as the community gardeners donate fresh vegetables to the food pantries during the growing season. Marlborough Park is over 20 acres and is located on Madison’s southwest side, near the University of Wisconsin Arboretum, south of the beltline. There are many amenities that serve the neighborhood including baseball and soccer fields, playgrounds, a shelter for gatherings, paved paths for biking and walking, and the community gardens. The surrounding residents live on either side of the park with Marlborough neighborhood on the east side along Seminole Highway, and Belmar and Allied Drive neighborhoods on the west side along Verona Road. Both neighborhoods are home to diverse populations. The over 100 gardeners draw mostly from these neighborhoods with over half Latinos, 10% of Hmong and Asian origin, and remaining white. Sharon and Pam Flinn are mother and daughter and residents in the Marlborough neighborhood for over 50 years. They came to garden at Marlborough Park 9 years ago when CAC assumed greater management of the garden. During their tenure, they watched the garden expand from the original plot of over 100 gardens to add a second plot of 65 gardens. They are hard workers and grow many of the vegetables that they eat, like many of the other gardeners. They store as much as they can by canning and freezing to last until the next growing season. They have been so immersed in the production of their food for years that they cannot say what their savings are by growing their own vegetables. Before they grew vegetables at MPCG, they grew them in their backyard. The MPCG location is on a slight hill with little tree cover. The natural light is good for growing sun loving plants, as tomatoes, eggplants, beans, peas, squash, corn, kale, and spinach. The gardens allow any plants that the gardener can grow, but for Pam growing flowers is a waste of valuable space that she and her mother only use for growing vegetables. When asked if the MPCG suits their needs, they respond with an enthusiastic yes, and that they pack their 2 garden plots, 20 by 20 feet each, with so many vegetables that they eat vegetables all summer and winter long. Pam says she runs green beans all around her gardens’ edges and was able to “put up” or freeze a bushel of beans. Additionally, they froze 2 bushels of tomatoes and canned 12 half gallon of dill pickles. Sharon is in her early 70’s and has had hip surgery in the last 5 years. She often brings her folding chair and provides company to Pam as she plants seeds, hoes out weeds, cultivates the soil, and waters from the 55 gallon drum on the north side of the garden. Sharon loves her time in the garden and visits with everyone who passes. Maria Salgado and Marina Soto are her garden neighbors and Sharon often inquires about their health and their families. Some of her neighbors do not speak English, but greets them anyway in English and always has a warm smile. Many of Madison’s community gardens are not tilled, and less than half of MPCG is tilled by a tractor that CAC rents. Most gardeners can keep their gardens from year to year, but only the no-till gardeners can get into them in early spring to plant. No-till gardeners can leave their fences and stakes up as well as their lawn chairs, paved walkways, birdhouses, and small play areas for children. The no-tilled areas allow perennials like kale, rhubarb, and asparagus to come back each year as well as the many volunteer plants that grow from seeds stored in the soil over winter, as tomatoes and sun flowers. Raju “John” Eliganti lives with his wife and 2 young sons, Indy 5 and Kiren 3, in the Marlborough neighborhood. Four years ago, he started with a half a garden plot in the no-tilled area. Now he has 2 plots. When Raju was a boy living with his family in India, he remembers his mother as an expert gardener. She grew vegetables using an overhead trellis for easy picking as the vegetables became heavy and hung down. He was always surprised to see the vegetables hang from the trellis growing larger and becoming ready to eat for dinner. Raju involves his sons, so they can learn, as he did as a youth, where vegetables come from and how they grow. They help to gather potatoes, for example. Raju digs them from the soil, and then the boys pick them up and put them in the buckets. The seed potatoes came from CAC which also provides seed packets of every possible vegetable and flower at spring registration. Raju’s sons come often to help their father and care for the garden and plants. They too are excited to see the tomatoes grow bigger. Raju’s garden is near the common area where he can borrow wheel barrows, hoes, and spades, and where his sons can play in the large sand box and playground equipment. There is also a picnic table for meetings and socializing and an enclosed bulletin board to post garden rules and event announcements. For Raju, one of the important benefits of the community garden is coming to know the other gardeners who pass by to their gardens or who are attending one of the potlucks or community workdays. When the gardening season ends in October, most gardeners are happy to put their gardens to bed. Many have invested a lot into preparing the gardens, cultivating the plants, and harvesting the vegetables and flowers. Once winter has come and gone, most gardeners are excited to get back out there to shake the ice and snow off their boots and start digging. Anyone interested in gardening in one of the community gardens can contact CAC through their website at www.cacscw.org/gardens.php <http://www.cacscw.org/gardens.php> . Last night one of the spans was lifted and put into place for the Military Ridge Trail Crossing of Highway PD at Verona Road. One more to go. Then paving. Soon we will be able to navigate this dangerous crossing in safety. According to the info out of Fitchburg and DOT, second half will go up in December, and the bridge-to-be will be put to bed for the winter. The bridge itself is scheduled to be ready for use around Memorial Day and the Cannonball Path (from Dunn’s Marsh and parts east) leading to it should be paved in July. Work has begun again on the Dawley bike hub at Dunn’s Marsh [in Dawley Park]. I’m not holding my breath of dates for that yet tho. Nice to see work happening again anyway. The long-awaited Cannonball Path Phase 3 bridge over Beltline Highway, just west of Fish Hatchery Road is open for use as of October 24. This new, four-span arched bridge carries bicyclists and pedestrians over the Beltline and both the north and south frontage roads, providing a safe (and fun!) alternative to the Fish Hatchery Road interchange. 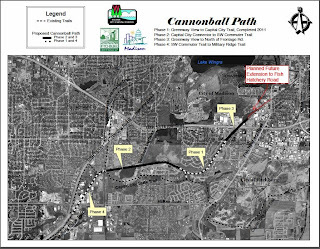 The bridge is also the key segment of the overall Cannonball Path project, which consists of more than four miles of paved shared-use (bicycle and pedestrian) path connecting neighborhoods in Fitchburg and Madison south of the Beltline with central Madison. Currently over 1.6 miles of path is paved, beginning at the Capital City Trail in Fitchburg and extending to the north Beltline frontage road. 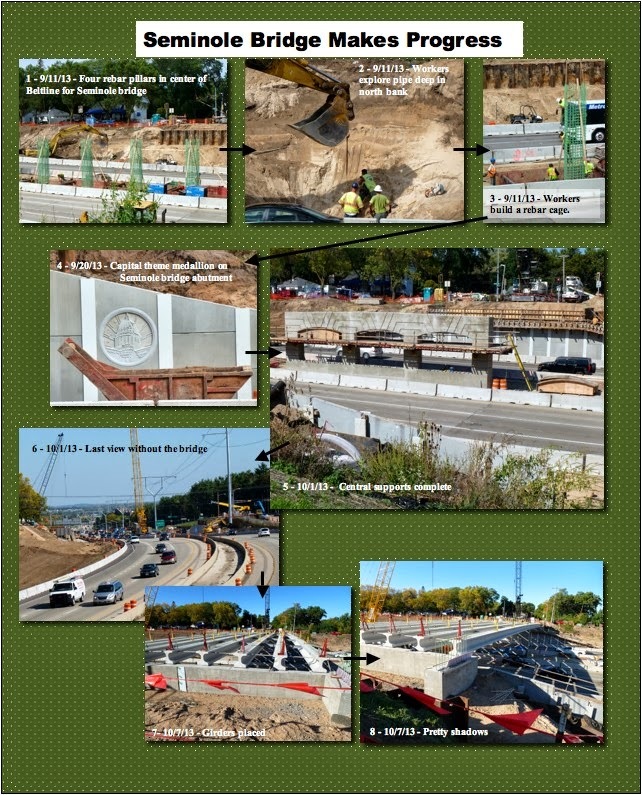 Contracts are in place and work has begun on the remaining length, including a new bridge over McKee Road (CTH PD). When completed next year the path will connect to the Military Ridge State Trail, Capital City Trail, Badger Trail and the Southwest path. Plans are being developed for the northward extension to Fish Hatchery Road and ultimately to the Wingra Path. Many have asked about a ribbon cutting. Nothing was planned for this year because of the uncertainty about the opening date and the lateness of the season. Next year we will be able to hold a big celebration, encompassing the full length of the project and recognizing the communities, governmental agencies, neighborhoods, citizens and builders who have contributed to this great new addition to the metro area’s bike and pedestrian network. 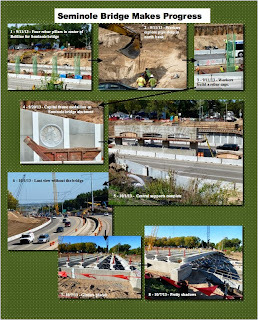 For more information please contact Tony Fernandez in Engineering at afernandez@cityofmadison.com <mailto:afernandez@cityofmadison.com> . 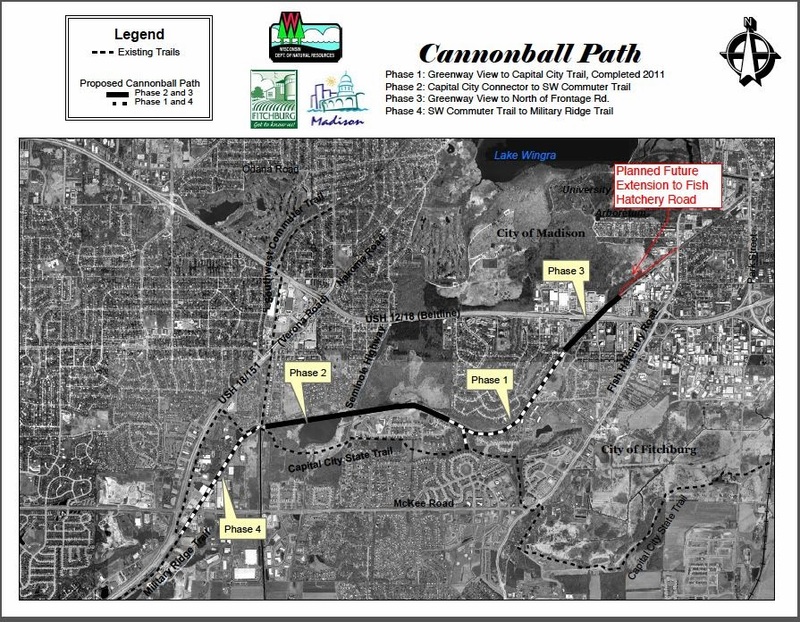 After years in planning and slow progress, Cannonball Path construction is speeding along like a ball shot out of a cannon. In conversations with Tony Fernandez, City of Madison Engineering, we’ve learned that the trail will soon stretch from its western connection to the Military Ridge Trail to an eastern connection with Fish Hatchery Road, Park Street, and beyond. Right now, the only paved portions are those labeled Phases 1 and 3 on the map. 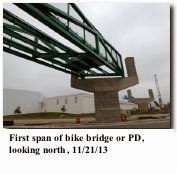 They extend from below Arbor Hills to the north side of the Beltline near Culvers. Phase 3 was completed by Madison this fall. But in 2014 Fitchburg will pave more sections. One is the path section below the Arboretum. Another is the portion that runs between Dunn’s Marsh and Belmar Hills. Together they are Phase 2 on the map. In 2014, the path beyond the junction of the Southwest Path/Badger State Trail/Capital City Trail, near the foot of Allied Drive will also be paved This is Phase 4 and will carry the trail to the Military Ridge Trail across County Highway PD where an overpass is partially completed. 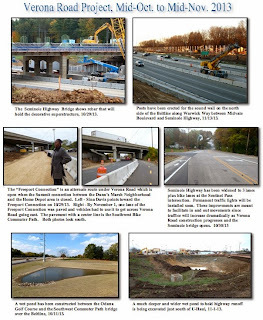 Two other articles detail the opening of the Cannonball bridge over the Beltline and the receent placing of half the bike bridge over PD just to the east of PD’s crossing of Highwy 18/151 (Verona Road). Phase 5 is the section from the Cannonball Beltline bridge northeast to Fish Hatchery Road. 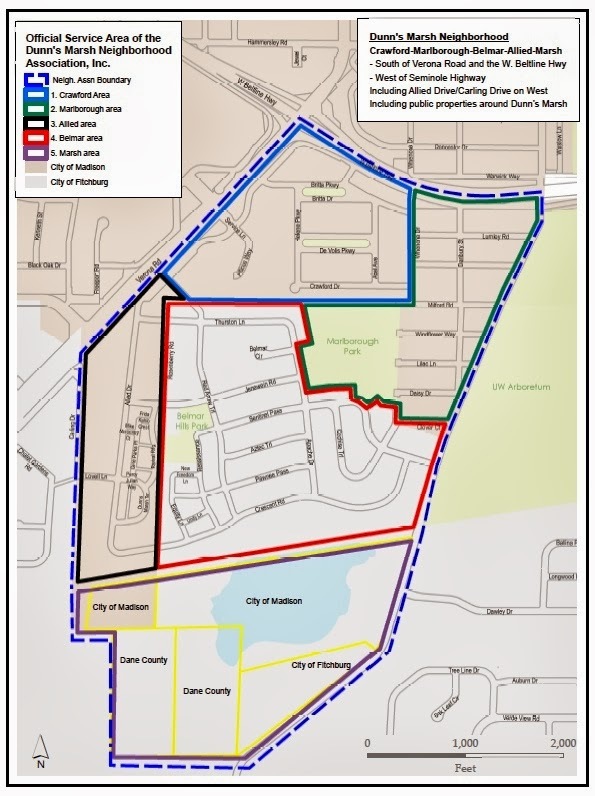 On the map it is called “Planned Future Extension to Fish Hatchery Road.” Fernandez explained that that portion is in the 2014 City of Madison budget. This part of the path can’t be on the railroad right-of-way since trains still use the tracks. 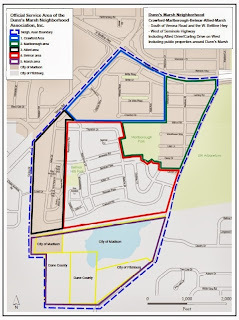 Fernandez noted that Madison Engineering has now started preliminary work on Phase 6 that would take the path across Fish Hatchery Road and Park Street to connect to the Wingra Bike Path along Wingra Creek. On the map, Wingra Creek is a hroizontal dark line crosing Park Street just beyond the railroad. (You’ll have to study the map closely to see this.) Currently, Engineering is looking at properties and considering how to piece together the route. Neighbor Connie Roderick forwarded a reference to a “Science Daily” article that notes that the negative effects of roads on wildlife are largely because of traffic noise. The study was done by Boise State University. Researchers put speakers that played traffic noise in an area that had no road. They found that the wildlife declined by more than 25% when the noise was on compared to when it wasn’t blasting traffic sounds. The research was conducted on a “phantom road on a ridge southeast from Lucky Peak, near the Idaho Bird Observatory’s field site.” Control sites showed no decrease. The City of Madison has started a drop off program for the recycling of household batteries. Madison residents can recycling their single use household batteries (A, AA, AAA, C, D, etc) by bringing them to the City’s two full service drop off sites as well as two Metcalf’s Market locations and the Williamson St. Co-op. Funds for the program come from savings realized from changes in the electronics recycling program. The batteries are being handled by Universal Recycling Technologies, the City’s electronics processor. For more information on the program residents can visit www.cityofmadison.com/streets , email gdreckmann@cityofmadison.com, or call the City Recycling office at 267-2626. In Dane County we’re fortunate to enjoy an incredible quality of life – the county’s abundant lakes and natural spaces are big reasons why. My 2014 budget makes the largest investment in lakes and lands in county history with bold solutions to reduce the amount of algae-causing phosphorus that enters and fouls our lakes and new partnerships to make our county parks better than ever. Dane County’s farm families have made important contributions to the ongoing efforts to improve lake health. My budget expands on this strong partnership with additional resources for farmers to help us clean up our lakes. A new $2 million “Phosphorus Reduction and Remediation Grant Program,” will allow for the acquisition and remediation of lands responsible for the highest percentage of phosphorus run-off in the Yahara System. I also fund exciting new technology for our second Cow Power manure digester, nearing completion in the Town of Springfield, that will eliminate 100% of the phosphorus in the manure the facility processes. And to help farmers address manure storage concerns during long, wet, winters and springs my budget also establishes a drop off site near the digester where farmers can safely dispose of their manure. Your Dane County parks will also be better than ever with new shelters and trails, and additional resources for park upkeep. My budget creates the “Dane County Youth Conservation Corps,” a life-skill development partnership with Operation Fresh Start will put young people to work keeping county parks and their amenities clean, accessible, and family friendly. I also create a new parks “Partnership and Outreach Coordinator” to build support for the county parks system and enhance the many free amenities we offer residents and visitors. These investments in lakes and lands in my 2014 budget will help protect the many reasons why more than a half-million people love to call Dane County home. 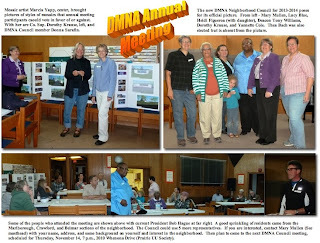 The newly-elected 2013-2014 Dunn’s Marsh Neighborhood Association Council will hold its first meeting on Thursday, November 14, 7 pm, at 2010 Whenona Drive (Prairie UU Society). The Council has 7 members but could accommodate 5 more members. Residents from the Belmar (Fitchburg) and Allied areas are particularly needed. Anyone potentially interested in joining the Council is especially invited to attend this meeting which will include an orientation to the DMNA. New officers will be elected from among the Council members, and the Council will set up committees for the year. The Dunn’s Marsh Neighborhood Association along with the Wisconsin Department of Transportation, the City of Madison, the City of Fitchburg, and many excited area residents are pleased to be able to officially open the Seminole Highway Bridge to traffic with a ribbon cutting at 9:00 PM on Thursday November 14th, 2013. Residents that desire to be among the first to drive across the new bridge can park either on the north side on Warwick Way, or on the south side, along the west-bound Beltline Frontage Road. 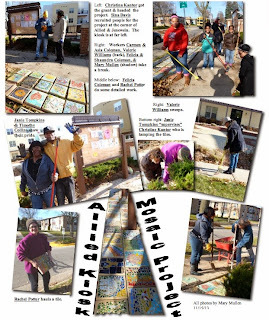 Help is desperately needed to complete a small Allied community art/landscaping project before the snow flies, specifically on Friday, November 15. 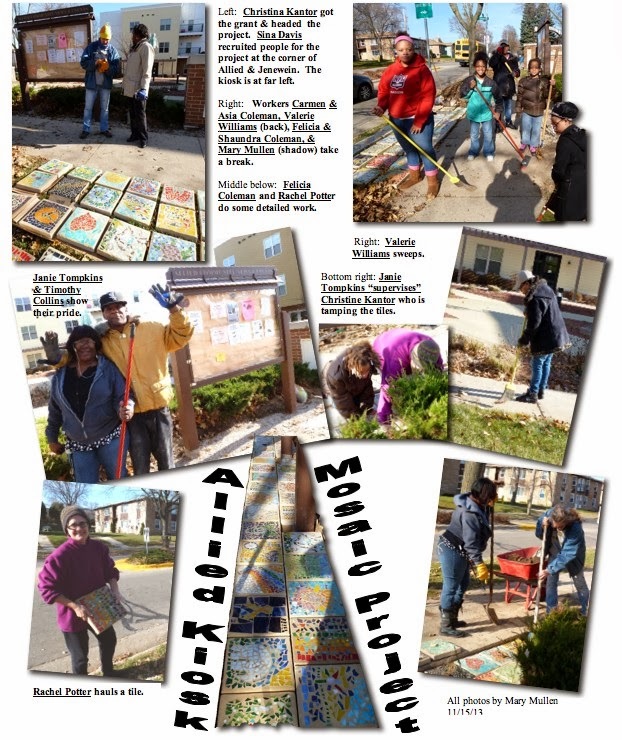 The ADMNA also had residents make stained glass mosaic stepping stones for landscaping under the sign. A professional contractor dug down, laid and prepped the substrate already, so we need to smooth the pea gravel and hand tamp it a bit, put down a layer of sand, then place the stones and then pour, sweep and hose down the sand between them. There are 36 12 x 12 stones. I have never done anything like this before but I am estimating 3-4 hours max. I would love to have anyone with experience, and if a landscaper or other business person wants to pitch in, we will put a special thank you to them in the next ADMNA neighborhood newsletter. Call Chris at 236-2899 to discuss timing and other details. I will provide food and drink, tools and supplies. 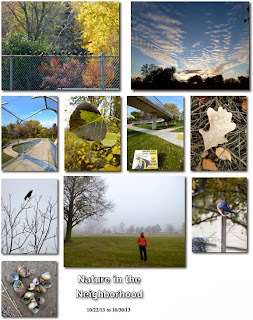 Late in October, nature put on some pleasant scenes. See some of them on the attached collage. Prairie UU. Society, 2010 Whenona Drive, invites you to a hauntingly good Halloween party, October 31, from 5 to 8 p.m.
Come in for a “bite” to eat, drink spooooky cider, and monster mash on the dance floor. All neighborhood kids are welcome along with adults who are chaperoning them for trick or treat activities in the neighborhood. Stop in as you pass by. I never had the bad experience of my mother choosing and making a Halloween witch costume that freaked me out. I never had to dress as a caveman to please my mother although that costume caused horrible humiliation to the boy who wore it and additional mortification to admit it was an a outstanding idea when he won first prize at the school contest. I don’t even remember the childhood Halloween get-ups I wore for this candy-filled holiday. Nonetheless, Halloween was a stellar event between 4th of July with all its beautiful and scary fireworks and Christmas, a child’s Garden of Eden. That day, October 31, which was always celebrated on that date as opposed to some more convenient weekend day, was a day of wonder. Nowadays, what kids know more than the first 3 words? I’ve never found any. They just look at me with vacant eyes when I ask, “Do you know the next line?” I think I once saw that two more lines finished the verse, but a quick look on the Internet found no such thing. Usually we got treats when the door opened: candy bars, hard candy in many colors, or home made treats like fudge or popcorn balls. No fear in the 1950s of razor blades in storebought or home- prepared sweets. We never got money although then even 5 cents would have seemed like a fortune to a 10-year-old. I didn’t get an allowance, I was too young to babysit for 25 cents or less an hour, and I was always encouraged to save the $3 check that my grandmother sent from Kentucky faithfully each Christmas, Easter, and birthday. Being a minister’s kid, I never did tricks to a stingy door-opener or someone who wouldn’t even crack the door to young witches and ghosts. The tricks were what I searched for the next day, November 1st. Tricks were everywhere. They were almost better than Halloween itself. First we kids would check our own front screen door. Had someone scribbled or written dirty words in soap there? Or had they used the impossible to remove paraffin? Had they covered a nearby porch window with Ivory or wax? I knew how hard it was to remove paraffin or candle wax. Next, I would look out the kitchen window to the outdoor privy behind the church which was right next door. Every year, the outhouse had been tipped over. I would rush out the back door, around the house, and to the churchyard to view the telephone-booth-sized house on its side close-up. Was it door down or door gaping to the side? If it was door down, I might knock or yell to see if someone was trapped inside. Of course I’d look in horror at the stinky contents in the now-exposed square hole. I could see a lot more in the full daylight than any time when the only view was through the open seat in dim light when the house was upright. The next place on my itinerary was downtown Wauzeka, a short 4-block walk. That’s where unbelievable sights greeted the amazed eyes of every young child. On the main street, I’d check the store windows for those self-same but much larger scrawls that appeared on our screen door and porch windows. I was never disappointed. Big white scribbly circles blasted out at me from picture windows of the businesses. Always. But best of all was what I saw on the top of buildings. Atop the only flat-topped commercial buildings, full-sized cars - the only kind of cars back in the 1950s - and gigantic farm machinery sat big as life. “Who did it?” I wondered. More importantly, how had they done it? How can anyone put a 2000-pound vehicle or piece of equipment on top of a roof? Take note, the cranes we see everyday here constructing 12-story apartment buildings or lifting girders onto the Seminole Highway bridge did not exist in my small town. Do kids do pranks like this anymore? If they did, I’m sure they’d be found out and arrested. Halloween is tame these days. Click on the attachment to see people who attended the DMNA Annual meeting on October 10. The newly-elected DMNA Neighborhood Council is featured. We can have 5 more Council members. Contact Mary Mullen mmullen@chorus.net> or call 298-0843 to volunteer. La Asociación de Vecinos del Dunn’s Marsh (DMNA) es para todos los que se preocupan por nuestro barrio. Vengan a hablar de las cosas que le gustan del barrio, compartan sus ideas y sus preocupaciones. Nos reuniremos en el Prairie UU Society en 2010 Whenona Drive; el Jueves, 10 de octubre a las 6:45 de la tarde. Miembros del DMNA eligen a sus representantes en esta reunión. Snacks para todos! Traducción al español sera disponible. Thursday, Oct. 10, 6:45 p.m.
It’s for everyone in the neighborhood regardless of your race, color, age, language, nationality, or sexual preference.. ALL are welcome! We need high school and college students, young adults, parents, workers, retirees, everyone. Any resident age 16 and older may join the association. Spanish translation will be provided as needed. · Because everyone has something to offer, and all will have the chance to speak. · Because you want to live in a beautiful, peaceful, full-service neighborhood, safe for children, safe for teenagers, safe for adults, safe for old people. · Because you want to know your neighbors. Remember: This Thursday, October 10, 6:45, Prairie UU Society, 2010 Whenona Drive. 9 - Need Help With Fall Tasks? What improvements to Metro service would you like to see? Metro Transit and the Madison Transit and Parking Commission will be hosting a public input session where riders can share their thoughts on Metro service. All input will be reviewed and considered during service planning in 2014 and beyond. The session will be held on Wednesday, October 9 at 6 PM in Room 260 of the Madison Municipal Building at 215 Martin Luther King, Jr. Blvd. The machines are still grinding away (and will for another 2 or 3 years), people are continuing to live their lives and have fun, and we have a nice new downtown public library. 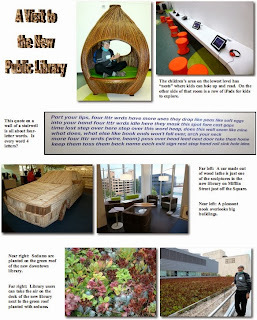 See this in the photo collages that are attachments to this e-News. Some of the activities pictured in “Summer Scenes” are the August 24 backpack giveaway at Second Baptist Church and the September 14 CAC Garden Days in Marlborough Park. 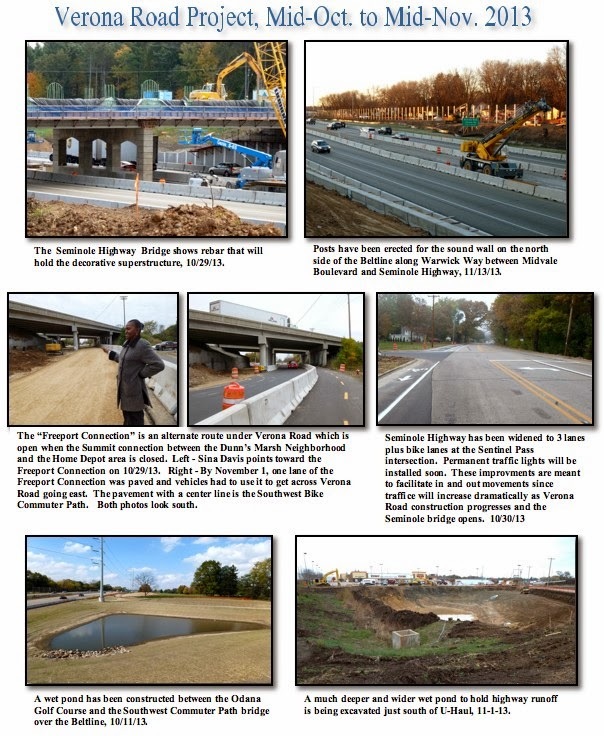 “Seminole Bridge” and “Pics Along the Frontage Roads” show progress on the Verona Road Project. 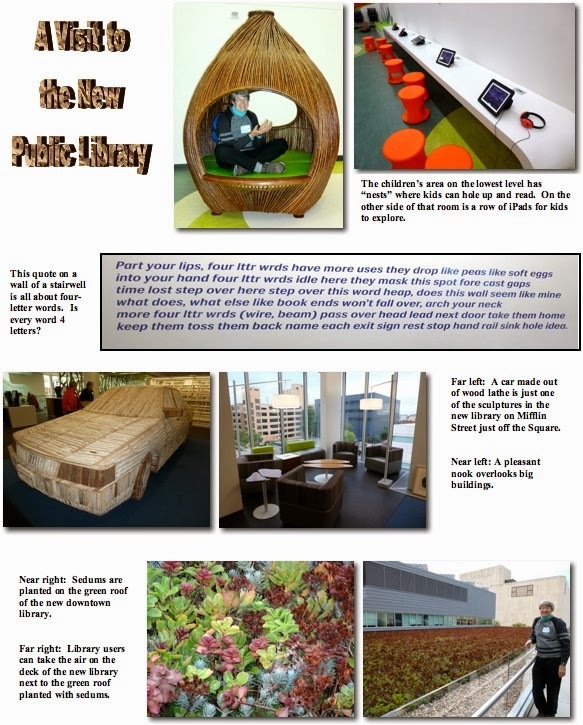 The “Library” collage features our new downtown library. Be sure to stop by there if you get down near the Square. It’s really worth seeing. The Fitchburg Planning and Parks Department staff have developed four recreation alternatives for the Nine Springs Golf Course property and they can be viewed at http://bit.ly/NineSpringsMP <http://bit.ly/NineSpringsMP> <http://bit.ly/NineSpringsMP <http://bit.ly/NineSpringsMP> >. The park, now a golf course, is on Fish Hatchery Road. The alternatives reflect information received from the public at an August 22nd visioning session and a community survey. These alternatives were reviewed and refined by the Park Commission on October 3rd. All except the first alternative include a paved and mowed trail system through the park. The revised alternatives will be presented at a public open house set for Thursday October 24th to receive public comment (Public Notice <http://www.city.fitchburg.wi.us/departments/cityHall/planning/documents/Public_Notice_102413meeting.pdf <http://www.city.fitchburg.wi.us/departments/cityHall/planning/documents/Public_Notice_102413meeting.pdf> > ). Location: the Fitchburg Christian Fellowship Church, 2924 Fish Hatchery Road, 6:30 pm. Comment Period — For those who cannot attend the open house, there will also be a 2-week public comment period on the alternatives from October 24-November 10. We hope that you will participate in this community planning project! Are you the owner or do you know the owner of a beautiful young gray tabby tom cat that showed up on Windflower Way in the past few days? He is very friendly and loves human attention, so he must belong to someone. The Humane Society doesn’t have a record of anyone looking for this lost cat. While I would probably never report or trap a pesky stray cat, there may be good reasons to get that naughty cat out of your yard. Live-trapping is an option. Killing a cat is illegal. In response to previous articles, several people volunteered information about what you can legally do. One person, a cat lover who works with Friends of Ferals, pointed out that Madison Animal Control will not trap a cat for you, but if you live-trap a cat, they will pick it up and take it to the Humane Society. A neighbor volunteered his experience. Regarding the cat and the live trapping. I think it is fine to live trap a cat in your yard. Just take it to the Dane County Humane Society. Based on hearsay from a friend quite familiar with the shelter, I'm told that they are "unofficially" a no-kill shelter. That is, I'm told that they are generally very successful in finding homes for healthy stray cats brought to the shelter. You do have to sign a form indicating that the cat may be euthanized if the owner (or new home) is not found. We had to use a live trap last month to trap a cat that somehow got into our unoccupied home that is for sale (!!). Another person gave me the list of the Animal Control supervisor for the City of Madison. It is 243-0327. Better yet, if you know the owner, simply talk to him or her about the troubles caused by the cat. Even if the owner does nothing, you may feel better. At least that was my experience when I talked to a neighbor about his incessantly barking dog. The dog kept barking, but somehow the noise didn’t bother me so much. Our front stepping stone walk [on Axel] was tagged on Monday [a few weeks ago]. Let us know if you hear of any other neighbors who have issues. The day earlier our trash can (and its contents) was pushed over into the street, our neighbor said he saw some teenage boys do it and he yelled at them. Make sure your car is safe and reliable for winter driving. This no cost, no obligation inspection is an importatnt step to get your car reading. This service is sponsored by RSVP, SW Madison TRIAD, Madison Police Department, and Firestone at West Towne. Do you or someone you know need help raking fall leaves, prepping the garden for winter, trimming a hedge, cleaning out gutters, painting, moving furniture,etc.? Once again, The Madison Blaze Women's Tackle Football Team is here to help. We have hard working, fun and polite women available to help with these tasks in exchange for a donation to the team. Contact Kim at kim@madisonblazefootball.com and we'll do what we can to help. The Madison Blaze is owned by an all-women ownership group consisting of current and former IWFL players. The team is entering it's 2nd Season with a core of veteran players, staff and coaches that hope to build upon the success of it's Inaugural 2013 Season. The Madison Blaze's mission is to promote and advance women's football in a professional manner while sustaining a positive identity in the community through leadership, guidance, and sound management. 2. Harvest Moon Festival – Fri., Oct. 11, 2013, 6-9 pm, Lussier Family Heritage Center, 3101 Lake Farm Road, Madison – Explore a torch-lit trail in the moonlight, while discovering the natural world through interpretive presentations and hands-on activities. Stargaze through telescopes with UW Universe in the Park and Space Place astronomers. Enjoy s’mores around the huge Howlin’ Bonfire and bluegrass music by Off the Porch and Friends. Bid on Silent Auction Items - $4/person or Free with $5/person Annual Membership to the Friends of Capital Springs Recreation Area. Contact 224-3604 or capsprings@gmail.com for more info. 3. Fitchburg Home Compost Bin and Yardwaste Polybag Sale – Sat., Oct. 19, 2013, 9-11am, Fitchburg Public Works Maintenance Facility, 2373 S. Fish Hatchery Rd., Fitchburg – Earth Machine home compost bins will be sold for $45 each (normally $100). Compost turners ($15 each, Kitchen scrap pails ($7 each), and 50 gallon yardwaste polybags ($2 each) will also be available for purchase. This is a one day only sale and will be held rain or shine. Cash and checks will be accepted, but not credit cards. Supplies will be sold on a first come, first served basis. Advanced registration is recommended by contacting rick.eilertson@fitchburgwi.gov or 270-4264 if you want to be sure that items are available to pick up during the sale. 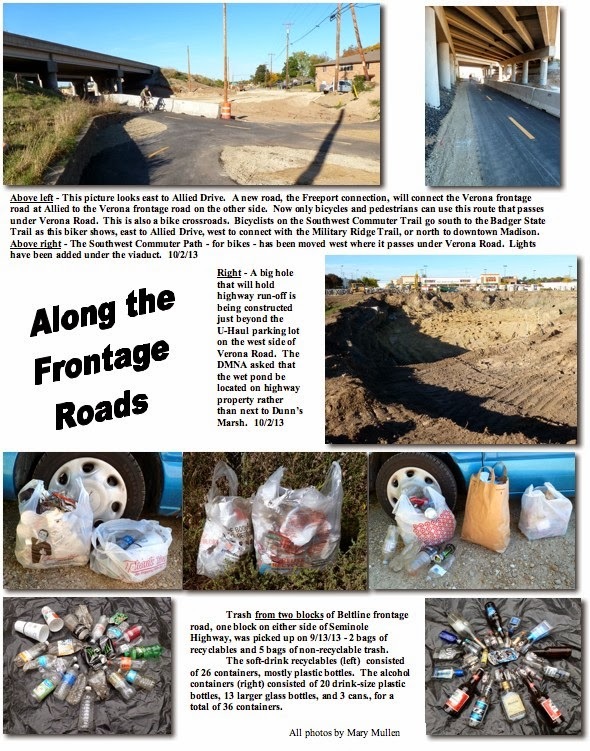 Please refer to the Fitchburg Update newsletter (http://www.city.fitchburg.wi.us/documents/newsletter.pdf <http://www.city.fitchburg.wi.us/documents/newsletter.pdf> ) for the full article or check www.fitchburgwi.gov/solidwaste <http://www.fitchburgwi.gov/solidwaste <http://www.fitchburgwi.gov/solidwaste> > for further details as the event approaches. 4. 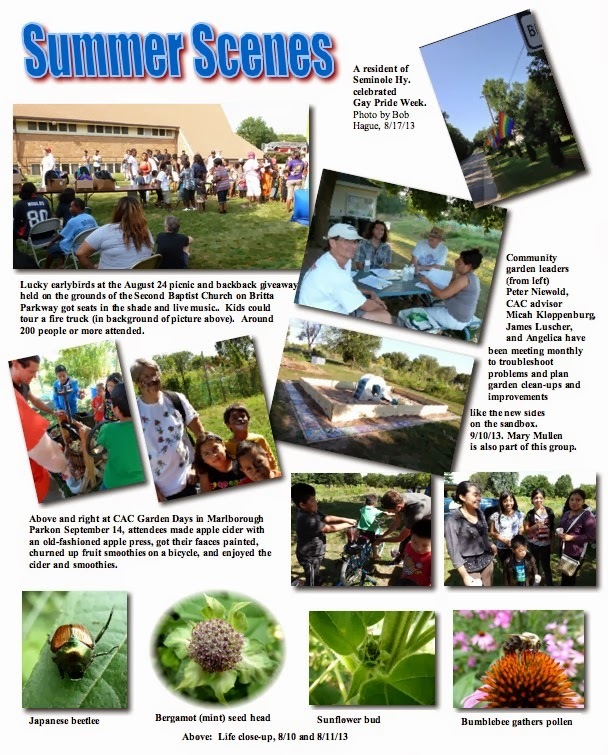 2013 Food Summit, Thurs., October 24th, 5:30-8pm at the Fitchburg Library, 5530 Lacy Road, Fitchburg - Dane County Food Council, in conjunction w/ Fitchburg and other partners, is hosting a Food Summit entitled Connecting with The Land to celebrate National Food Day. ... Read More… <http://www.city.fitchburg.wi.us/documents/GreenE-NewsBlast34.pdf <http://www.city.fitchburg.wi.us/documents/GreenE-NewsBlast34.pdf> > Visit: http://www.city.fitchburg.wi.us/documents/2013FoodDayregistrationformfinal.pdf <http://www.city.fitchburg.wi.us/documents/2013FoodDayregistrationformfinal.pdf> to print a registration form or register online at: http://fyi.uwex.edu/danefoodsystem/2013/09/21/2013-food-summit/ <http://fyi.uwex.edu/danefoodsystem/2013/09/21/2013-food-summit/> . 5. 2013 Wisconsin Bike Summit, Fri., October 25th, 7:30am-5:15pm, Best Western Inn on the Park, Madison - Join the Wisconsin Bike Fed for an inspiring and informative day that brings our bicycling community together. ... Read More… <http://www.city.fitchburg.wi.us/documents/GreenE-NewsBlast34.pdf <http://www.city.fitchburg.wi.us/documents/GreenE-NewsBlast34.pdf> > Special features of the Bike Summit include lunch with special guest, legendary Tour de France commentator, Phil Liggett, and a welcome to Wisconsin Bike Fed’s new Executive Director, Dave Cieslewicz. Visit: http://wisconsinbikefed.org/events/bike-summit/ <http://wisconsinbikefed.org/events/bike-summit/> for more information. 6. Fitchburg’s Fall 2013 Electronics Recycling & Shred Day Events – Sat., Oct. 26, 2013, 7:30-10:30am – The Electronics Recycling Event will be held at Surplus-IT’s warehouse (901 Watson Avenue, Madison). Look for directional signage from the intersection of Fish Hatchery Road and Greenway Cross heading to the east. ... Read More… <http://www.city.fitchburg.wi.us/documents/GreenE-NewsBlast34.pdf <http://www.city.fitchburg.wi.us/documents/GreenE-NewsBlast34.pdf> > The Shred Day Event will be held in Oak Bank’s parking lot (5951 McKee Road, Fitchburg). ... Read More… <http://www.city.fitchburg.wi.us/documents/GreenE-NewsBlast34.pdf <http://www.city.fitchburg.wi.us/documents/GreenE-NewsBlast34.pdf> > Please contact Felipe Avila, Engineering/GIS Specialist at 270-4277 or felipe.avila@fitchburgwi.gov, with any questions about electronic recycling and/or shred events. 7. Fitchburg Green Thursday Event – “Nine Springs Creek Watershed Master Plan Public Involvement Meeting” – held Thurs., September 26, 2013 – Presentation slides now available – A video of the presentation is now available on FACTv’s web page at: http://factv.city.fitchburg.wi.us/Cablecast/Public/Show.aspx?ChannelID=1&ShowID=2662 <http://factv.city.fitchburg.wi.us/Cablecast/Public/Show.aspx?ChannelID=1&amp;ShowID=2662> <http://factv.city.fitchburg.wi.us/Cablecast/Public/Show.aspx?ChannelID=1&amp;ShowID=2662 <http://factv.city.fitchburg.wi.us/Cablecast/Public/Show.aspx?ChannelID=1&amp;ShowID=2662> > . Powerpoint slides are available at: http://www.city.fitchburg.wi.us/departments/cityHall/publicWorks/stormwater/NineSpringsMasterPlan.php <http://www.city.fitchburg.wi.us/departments/cityHall/publicWorks/stormwater/NineSpringsMasterPlan.php> along with concept maps of 18 different areas throughout the watershed for suggested best management practice areas, including: Crescent Road Storm Discharge, Pine Ridge Pond, Seminole Village Pond, Lacy Heights Pond, McKee Farms Park, Triverton Greenway, Nine Springs Golf Course, Fish Hatchery Road, Chapel Valley West and East Ponds, Marketplace x Schumann Pond, Arrowhead East Pond, Seminole Hills Pond, Design Mart Pond, Ninebark x S. Syene Pond, Thermofisher Pond, Hatchery Hill – Casa Del Sol Ponds, and Sub Zero Pond(s). Please visit the web page link above for more details on the Master Plan or contact rick.eilertson@fitchburgwi.gov. 5. Use rain barrels to collect rainwater for your garden or install smart sprinkler devices with moisture sensors. An article in July/August AARP Bulletin, a publication for older Americans, listed “99 Great Ways to Save.” Here are just a few that caught my attention. 1. To scare away bugs and insects, just hang a fabric softener sheet next to, but not touching, your outdoor light fixtures. They don’t like the scent. The sheets are cheaper than bug zappers and pesticides. 2. Weeds can be killed with an eco-friendly spray made from 1 gallon of white distilled vinegar mixed with 1 ounce of liquid dish soap. 3. Try out a teaspoon of dish soap in your top-loading washer to clean your clothes. Cheaper than laundry detergent. 4. Insulate out-of-the way windows with bubble wrap by spraying the window with water and pressing a cut-to-size sheet of bubble wrap to the window. Clings for months. 5. Kill fleas in pillows, blankets, and throw-rugs by sealing them in a plastic bag and putting the bag in your car in the sun - with rolled up windows. Leave them for 2 or 3 hours. The extreme heat will kill the fleas. Do NOT try this on your pet as the heat will kill your pet. 6. Want to know if your toilet is leaking? Test your toilet by adding a package of grape Kool-Aid to your toilet tank. If the water in the toilet bowl turns purple, your toilet is leaking away water and money. 7. Puffy eyes can be treated with a cucumber slice or a cold moist teabag. 8. Grow romaine lettuce, celery, spring onions, napa cabbage, bok choy and similar vegetables by placing the bottom inch or two in a glass of water near a sunny window. Cut a thin layer off the stub first. 9. Get better gas mileage by keeping your car windows shut when going 55 mph or higher. When sitting in stop and go traffic, open the windows and turn off the air conditioner. 10. Buy “index funds” instead of actively manaaged investment funds can cut your investing expenses by up to 80% annually, AND they consistently out-perform actively managed accounts. In 2010 the U.S. Congress passed the Affordable Care Act (ACA) to refore health insurance coverage for Americans. Some provisions have taken effect in the past 3 years, and you may already have benefitted from them. For example, you may not be denied health insurance because of a preexisting condition. Secondly, insurance companies cannot impose annual limits or lifetime limits on coverage. Another benefit is that children may stay on their parents’ insurance until age 26. Still another provision of ObamaCare is that you can’t be dropped if you get sick or injured. Another aspect of the ACA is the requirement that uninsured and underinsured people will be eligible to purchase health insurance on Health Insurance Marketplaces beginning October 1. Every state will have them. A nice feature is that low income people will be able to get financial help to purchase health insurance. However, because Wisconsin “opted out” of federal help to insure more people under Medicaid, those less well-off people who could have been covered, won’t get help. A good place to get information about the ACA is from Working America at http://action.workingamerica.org/c/1711/p/salsa/web/common/public/signup?signup_page_KEY=7152&tag=signon <http://action.workingamerica.org/c/1711/p/salsa/web/common/public/signup?signup_page_KEY=7152&amp;tag=signon> There you can sign up to get health care updates. While you are on the site, also look at the Frequently Asked Questions (FAQ). Although about half the states have chosen to run their own health insurance exchanges, our governor Scot Walker, has decided to let the federal government develop and run the health insurance exchange here. However, in reading over this document, I still had questions. For example the Wisconsin FAQ document suggests that health insurance premiums will go up for people using the Health Insurance Exchange. But in another answer, it pointed out that insurers must charge the same amount for similar plans whether they are sold through the Exchange or in the private marketplace outside of the exchange. It should be noted that individuals and families with incomes between 100% and 400% of the poverty level ($11,945 to $43,320 for individuals and $23,681 to $88,200 for a family of four) can get a premium tax credit and that credit will be paid directly to your insurance company to lower the premiums. Only consumers who purchase their insurance through the Exchange are eligible for the premium tax credit. For example, if you are a single person who doesn’t smoke with income of $30,000 a year in 2014, your income is at 261% of the poverty level. The unsubsidized annual premium would be $3,018 but you could receive a government tax credit of $507. This would leave you to pay $2,512 per year. This does not include out-of-pocket costs of health care which could be no more than $6,350. This is under the “silver” plan that will pay for 70% of expenses for covered benefits. To find out more about the governor’s decision to have a federally-operated Health Insurance Exchange, check out http://www.healthinsurance.org/wisconsin-state-health-insurance-exchange/ On that site, is a link to a profile of Wisconsin related to health insurance exchanges. The place to go to apply for coverage, to compare plans, and to enroll in the Health Insurance Exchange in Wisconsin is www.healthcare.gov <http://www.healthcare.gov> The site was ready for action on October 1, but as we’ve been hearing on the news, the large number of people who applied in the first days caused the sign-up system to tank. When it’s all fixed, the site should be VERY EASY to use. A nice thing about it is that you’ll be able to see all the options you qualify for including private insurance plans and free and low-cost coverage through Medicaid and the Children’s Health Insurance Program (CHIP). If you are on Medicare, you are considered already covered and need do nothing. Regardless of whether you can successfully use the site now, you can sign up for updates and you can gather information you will need. 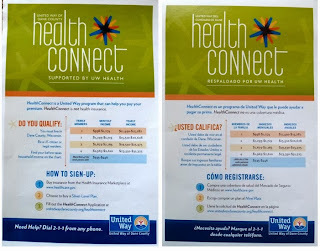 Hints on how to get ready are at https://www.healthcare.gov/how-can-i-get-ready-to-enroll-in-the-marketplace/ <file://localhost/how-can-i-get-ready-to-enroll-in-the-marketplace> A live chat is available on this page. People called “navigators” will be trained and certified to help you understand your options and enroll in a plan. Imagine walking the trail at one of your favorite Dane County parks on a Fall day – golden leaves blazing against a clear blue sky, tall grass or trees on either side of you, a crispness in the air. Now imagine that same walk with a county parks naturalist by your side, pointing out decades of history from the area, or plants and animals the untrained eye might otherwise miss. A new public/private partnership between the Madison Community Foundation and Dane County Parks can make it happen. Together we’ve created a private endowment that will enable anyone with a passion for the parks to make a tax deductible donation of any asset, including cash, stocks, and real estate. “The Friends of Dane County Parks Endowment” will be used to create even more opportunities for families to enjoy our natural resources. Our county parks and most of their amenities – from trails to green gathering space – are absolutely free. This endowment will help us do even more – campfire talks; educational displays at park historical sites; day camps and other programming to connect school groups or underserved populations with the parks, and much more. The Madison Community Foundation is offering a 2 to 1 matching grant of $50,000 through December of 2014, and the Phil and Elizabeth “Libby” Lewis family, longtime conservation leaders and supporters of our county parks, are giving a generous donation of $10,000 to ensure a strong start for our new fund. At more than two million visitors annually, our county parks are an important part of what makes Dane County a great place to live, work, and raise a family. This exciting new partnership ensures our parks remain that way forever. Individuals interested in making a gift to The Friends of Dane County Parks Endowment are encouraged to contact Darren Marsh, Dane County Parks Director, at 608.224.3766, or Harmony Kronick, Operations Director at the Madison Community Foundation, at 608.232.1763. The Fox6Now.com website from Milwaukee starts with the headline “College applicant told charter school diploma is worthless.” The story is a warning that not all schools are equal, and attending one that is not accredited can be a bad decision. David Sheriff, the father of the girl whose diploma was considered bogus because of lack of accreditation, gives this warning: “If you are looking to put your children in a specific school, especially if it says “charter” or “choice,” investigate that school. Don’t be fooled into getting a diploma you pay for online. I found one such website that would give a high school diploma for $219. You had to read the small print to find out that this was not really a school and that the organization only did “self-accrediting.” FAQs indicated that a person could get a diploma within 2-3 days after their payment was received. FAQs also indicated that you should not try to use the diploma to get into college. Come to the DMNA Annual meeting, Thursday, 10/10/13, at Prairie UU Society.